On June 25th we reported that Claude Niek of CSO Yachts represented the buyer in the sale of Baglietto's 43m superyacht Macalulu. Now Claude tells me that he's been appointed the new owner's representative as well, for the sale of the yacht, now renamed Le Yana. Built in 2007 to ABS class and MCA compliant, Le Yana has accommodation for 10 guests in a master, two doubles and two twins. 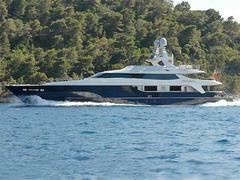 With a Zen-style contemporary interior, she also has zero speed stabilisers and is now on the market asking €21 million.